By Mrs. H. R. Haweis. Illustrated with pictures and woodcuts by the author. A beautifully laid out—and perfectly accurate to the original—copy of one of the most famous books on how to teach Chaucer to children ever issued. Despite its name, this work is directed at explaining and teaching Chaucer—and is equally presentable to both youngsters and adults. This book, and its author, Mary Eliza Haweis (who wrote using her married name), are widely credited with reviving Chaucer’s poetry in the modern world. These stories from The Canterbury Tales, along with some of Chaucer’s shorter poems, were the first to be presented in their original Middle English format alongside contemporary English. In addition, the translations are supplemented by copious footnotes providing many fascinating details and background information, setting the scene, tone, and history of each of these marvelous tales. In addition to the extensive translations and retellings, the author also provided all of the illustrations: her pre-Raphaelite style drawings transforming an already classic piece of English literature into a work of art. “I believe that some knowledge of, or at least interest in, the domestic life and manners of the thirteenth, fourteenth, and fifteenth centuries, would materially help young children in their reading of English history. The political life would often be interpreted by the domestic life, and much of that time which to a child’s mind forms the dryest portion of history, because so unknown, would then stand out as it really was, glorious and fascinating in its vigour and vivacity, its enthusiasm, and love of beauty and bravery. There is no clearer or safer exponent of the life of the fourteenth century, as far as he describes it, than Geoffrey Chaucer. “As to the difficulties of understanding Chaucer, they have been greatly overstated. An occasional reference to a glossary is all that is requisite; and, with a little attention to a very simple general rule, anybody with moderate intelligence and an ear for musical rhythm can enjoy the lines. “How much of the beauty and natural swing of Chaucer’s poetry is lost by translation into modern English, is but too clear when that beauty is once perceived; but I thought some modernization of the old lines would help the child to catch the sense of the original more readily: for my own rendering, I can only make the apology that when I commenced my work I did not know it would be impossible to procure suitable modernized versions by eminent poets.” —from the author’s introduction. This edition has been completely reset and the illustrations have been restored to better than original through modern digital enhancement. About the author: Mary Eliza Haweis, née Joy (1848–1898), was the daughter of the painter Thomas Musgrave Joy, and an artist in her own right, who first won fame with her exhibition at the Royal Academy under her maiden name Miss M. E. Joy. Her literary career started after she married Hugh Reginald Haweis, and after illustrating his books, started writing her own using the name “Mrs. 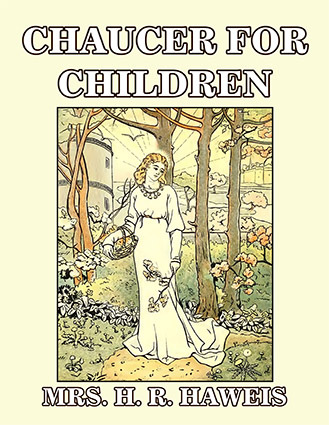 H. R. Haweis.” Chaucer for Children was her very first book, and catapulted her to instant fame. She followed this up with several other works centered around art, fashion, history, and literature, including The Art of Beauty (1878), The Art of Dress (1879), The Art of Decoration (1881), and The Art of Housekeeping (1889). From 1880 she wrote essays on artistic houses, first published in the magazine The Queen. Apart from her literary work, she is also remembered for her successful campaign to have museums opened on Sundays—revolutionary at the time, but now standard practice around the globe.